"Ramses II" redirects here. For the armored vehicle, see Ramses II tank. Ramesses II /ˈræməsiːz, ˈræmsiːz, ˈræmziːz/ (variously also spelt Rameses or Ramses (Ancient Egyptian: rꜥ-ms-sw "Ra is the one who bore him" > Koinē Greek: Ῥαμέσσης, translit. Rhaméssēs); born c. 1303 BC; died July or August 1213; reigned 1279–1213), also known as Ramesses the Great, was the third pharaoh of the Nineteenth Dynasty of Egypt. He is often regarded as the greatest, most celebrated, and most powerful pharaoh of the New Kingdom. His successors and later Egyptians called him the "Great Ancestor". He is known as Ozymandias in Greek sources (Koinē Greek: Οσυμανδύας Osymandýas), from the first part of Ramesses' regnal name, Usermaatre Setepenre, "The Maat of Ra is powerful, Chosen of Ra". Ramesses II led several military expeditions into the Levant, reasserting Egyptian control over Canaan. He also led expeditions to the south, into Nubia, commemorated in inscriptions at Beit el-Wali and Gerf Hussein. The early part of his reign was focused on building cities, temples, and monuments. He established the city of Pi-Ramesses in the Nile Delta as his new capital and used it as the main base for his campaigns in Syria. At fourteen, he was appointed prince regent by his father, Seti I. He is believed to have taken the throne in his late teens and is known to have ruled Egypt from 1279 to 1213 BC. Manetho attributes Ramesses II a reign of 66 years and 2 months; most Egyptologists today believe he assumed the throne on May 31, 1279 BC, based on his known accession date of III Season of the Harvest, day 27. Estimates of his age at death vary; 90 or 91 is considered most likely. Ramesses II celebrated an unprecedented fourteen Sed festivals (the first held after 30 years of a pharaoh's reign, and then, every three years) during his reign—more than any other pharaoh. On his death, he was buried in a tomb in the Valley of the Kings; his body was later moved to a royal cache where it was discovered in 1881, and is now on display in the Egyptian Museum. Early in his life, Ramesses II embarked on numerous campaigns to restore possession of previously held territories lost to the Nubians and Hittites and to secure Egypt's borders. He was also responsible for suppressing some Nubian revolts and carrying out a campaign in Libya. Although the Battle of Kadesh often dominates the scholarly view of the military prowess and power of Ramesses II, he nevertheless enjoyed more than a few outright victories over the enemies of Egypt. During Ramesses II's reign, the Egyptian army is estimated to have totaled about 100,000 men; a formidable force that he used to strengthen Egyptian influence. In his second year, Ramesses II decisively defeated the Sherden sea pirates who were wreaking havoc along Egypt's Mediterranean coast by attacking cargo-laden vessels travelling the sea routes to Egypt. The Sherden people probably came from the coast of Ionia, from southwest Anatolia or perhaps, also from the island of Sardinia. Ramesses posted troops and ships at strategic points along the coast and patiently allowed the pirates to attack their perceived prey before skillfully catching them by surprise in a sea battle and capturing them all in a single action. A stele from Tanis speaks of their having come "in their war-ships from the midst of the sea, and none were able to stand before them". There probably was a naval battle somewhere near the mouth of the Nile, as shortly afterward, many Sherden are seen among the pharaoh's body-guard where they are conspicuous by their horned helmets having a ball projecting from the middle, their round shields, and the great Naue II swords with which they are depicted in inscriptions of the Battle of Kadesh. In that sea battle, together with the Sherden, the pharaoh also defeated the Lukka (L'kkw, possibly the later Lycians), and the Šqrsšw (Shekelesh) peoples. The immediate antecedents to the Battle of Kadesh were the early campaigns of Ramesses II into Canaan. His first campaign seems to have taken place in the fourth year of his reign and was commemorated by the erection of what became the first of the Commemorative stelae of Nahr el-Kalb near what is now Beirut. The inscription is almost totally illegible due to weathering. Additional records tell us that he was forced to fight a Canaanite prince who was mortally wounded by an Egyptian archer, and whose army subsequently, was routed. Ramesses carried off the princes of Canaan as live prisoners to Egypt. Ramesses then plundered the chiefs of the Asiatics in their own lands, returning every year to his headquarters at Riblah to exact tribute. In the fourth year of his reign, he captured the Hittite vassal state of the Amurru during his campaign in Syria. The Battle of Kadesh in his fifth regnal year was the climactic engagement in a campaign that Ramesses fought in Syria, against the resurgent Hittite forces of Muwatallis. The pharaoh wanted a victory at Kadesh both to expand Egypt's frontiers into Syria, and to emulate his father Seti I's triumphal entry into the city just a decade or so earlier. He also constructed his new capital, Pi-Ramesses. There he built factories to manufacture weapons, chariots, and shields, supposedly producing some 1,000 weapons in a week, about 250 chariots in two weeks, and 1,000 shields in a week and a half. After these preparations, Ramesses moved to attack territory in the Levant, which belonged to a more substantial enemy than any he had ever faced in war: the Hittite Empire. Ramesses's forces were caught in a Hittite ambush and outnumbered at Kadesh when they counterattacked and routed the Hittites, whose survivors abandoned their chariots and swam the Orontes river to reach the safe city walls. Ramesses, logistically unable to sustain a long siege, returned to Egypt. Egypt's sphere of influence was now restricted to Canaan while Syria fell into Hittite hands. Canaanite princes, seemingly encouraged by the Egyptian incapacity to impose their will and goaded on by the Hittites, began revolts against Egypt. In the seventh year of his reign, Ramesses II returned to Syria once again. This time he proved more successful against his Hittite foes. During this campaign he split his army into two forces. One force was led by his son, Amun-her-khepeshef, and it chased warriors of the Šhasu tribes across the Negev as far as the Dead Sea, capturing Edom-Seir. It then marched on to capture Moab. The other force, led by Ramesses, attacked Jerusalem and Jericho. He, too, then entered Moab, where he rejoined his son. The reunited army then marched on Hesbon, Damascus, on to Kumidi, and finally, recaptured Upi (the land around Damascus), reestablishing Egypt's former sphere of influence. Ramesses extended his military successes in his eighth and ninth years. He crossed the Dog River (Nahr al-Kalb) and pushed north into Amurru. His armies managed to march as far north as Dapur, where he had a statue of himself erected. The Egyptian pharaoh thus found himself in northern Amurru, well past Kadesh, in Tunip, where no Egyptian soldier had been seen since the time of Thutmose III, almost 120 years earlier. He laid siege to the city before capturing it. His victory proved to be ephemeral. In year nine, Ramesses erected a stele at Beth Shean. After having reasserted his power over Canaan, Ramesses led his army north. A mostly illegible stele near Beirut, which appears to be dated to the king's second year, was probably set up there in his tenth. The thin strip of territory pinched between Amurru and Kadesh did not make for a stable possession. Within a year, they had returned to the Hittite fold, so that Ramesses had to march against Dapur once more in his tenth year. This time he claimed to have fought the battle without even bothering to put on his corslet, until two hours after the fighting began. Six of Ramesses's youthful sons, still wearing their side locks, took part in this conquest. He took towns in Retenu, and Tunip in Naharin, later recorded on the walls of the Ramesseum. This second success at the location was equally as meaningless as his first, as neither power could decisively defeat the other in battle. The deposed Hittite king, Mursili III, fled to Egypt, the land of his country's enemy, after the failure of his plots to oust his uncle from the throne. Ḫattušili III responded by demanding that Ramesses II extradite his nephew back to Hatti. This demand precipitated a crisis in relations between Egypt and Hatti when Ramesses denied any knowledge of Mursili's whereabouts in his country, and the two empires came dangerously close to war. Eventually, in the twenty-first year of his reign (1258 BC), Ramesses decided to conclude an agreement with the new Hittite king, Ḫattušili III, at Kadesh to end the conflict. The ensuing document is the earliest known peace treaty in world history. The peace treaty was recorded in two versions, one in Egyptian hieroglyphs, the other in Akkadian, using cuneiform script; both versions survive. Such dual-language recording is common to many subsequent treaties. This treaty differs from others, in that the two language versions are worded differently. While the majority of the text is identical, the Hittite version says the Egyptians came suing for peace and the Egyptian version says the reverse. The treaty was given to the Egyptians in the form of a silver plaque, and this "pocket-book" version was taken back to Egypt and carved into the temple at Karnak. The treaty was concluded between Ramesses II and Ḫattušili III in year 21 of Ramesses's reign (c. 1258 BC). Its 18 articles call for peace between Egypt and Hatti and then proceeds to maintain that their respective deities also demand peace. The frontiers are not laid down in this treaty, but may be inferred from other documents. The Anastasy A papyrus describes Canaan during the latter part of the reign of Ramesses II and enumerates and names the Phoenician coastal towns under Egyptian control. 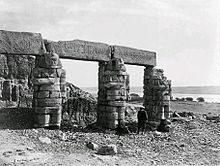 The harbour town of Sumur, north of Byblos, is mentioned as the northern-most town belonging to Egypt, suggesting it contained an Egyptian garrison. No further Egyptian campaigns in Canaan are mentioned after the conclusion of the peace treaty. The northern border seems to have been safe and quiet, so the rule of the pharaoh was strong until Ramesses II's death, and the waning of the dynasty. When the King of Mira attempted to involve Ramesses in a hostile act against the Hittites, the Egyptian responded that the times of intrigue in support of Mursili III, had passed. Ḫattušili III wrote to Kadashman-Enlil II, Kassite king of Karduniaš (Babylon) in the same spirit, reminding him of the time when his father, Kadashman-Turgu, had offered to fight Ramesses II, the king of Egypt. The Hittite king encouraged the Babylonian to oppose another enemy, which must have been the king of Assyria, whose allies had killed the messenger of the Egyptian king. Ḫattušili encouraged Kadashman-Enlil to come to his aid and prevent the Assyrians from cutting the link between the Canaanite province of Egypt and Mursili III, the ally of Ramesses. Ramesses II also campaigned south of the first cataract of the Nile into Nubia. When Ramesses was about 22, two of his own sons, including Amun-her-khepeshef, accompanied him in at least one of those campaigns. By the time of Ramesses, Nubia had been a colony for 200 years, but its conquest was recalled in decoration from the temples Ramesses II built at Beit el-Wali (which was the subject of epigraphic work by the Oriental Institute during the Nubian salvage campaign of the 1960s), Gerf Hussein and Kalabsha in northern Nubia. On the south wall of the Beit el-Wali temple, Ramesses II is depicted charging into battle against the Nubians in a war chariot, while his two young sons, Amun-her-khepsef and Khaemwaset, are shown behind him, also in war chariots. A wall in one of Ramesses's temples says he had to fight one battle with the Nubians without help from his soldiers. During the reign of Ramesses II, the Egyptians were evidently active on a 300-kilometre (190 mi) stretch along the Mediterranean coast, at least as far as Zawyet Umm El Rakham. Although the exact events surrounding the foundation of the coastal forts and fortresses is not clear, some degree of political and military control must have been held over the region to allow their construction. There are no detailed accounts of Ramesses II's undertaking large military actions against the Libyans, only generalised records of his conquering and crushing them, which may or may not refer to specific events that were otherwise unrecorded. It may be that some of the records, such as the Aswan Stele of his year 2, are harking back to Ramesses's presence on his father's Libyan campaigns. Perhaps it was Seti I who achieved this supposed control over the region, and who planned to establish the defensive system, in a manner similar to how he rebuilt those to the east, the Ways of Horus across Northern Sinai. After reigning for 30 years, Ramesses joined a select group that included only a handful of Egypt's longest-lived rulers. By tradition, in the 30th year of his reign Ramesses celebrated a jubilee called the Sed festival. These were held to honour and rejuvenate the pharaoh's strength. Only halfway through what would be a 66-year reign, Ramesses already had eclipsed all but a few of his greatest predecessors in his achievements. He had brought peace, maintained Egyptian borders, and built great and numerous monuments across the empire. His country was more prosperous and powerful than it had been in nearly a century. Ramesses built extensively throughout Egypt and Nubia, and his cartouches are prominently displayed even in buildings that he did not construct. There are accounts of his honor hewn on stone, statues, and the remains of palaces and temples—most notably the Ramesseum in western Thebes and the rock temples of Abu Simbel. He covered the land from the Delta to Nubia with buildings in a way no monarch before him had. He also founded a new capital city in the Delta during his reign, called Pi-Ramesses. It previously had served as a summer palace during Seti I's reign. His memorial temple, known today as the Ramesseum, was just the beginning of the pharaoh's obsession with building. When he built, he built on a scale unlike almost anything before. In the third year of his reign, Ramesses started the most ambitious building project after the pyramids, which were built almost 1,500 years earlier. The population was put to work changing the face of Egypt. In Thebes, the ancient temples were transformed, so that each one of them reflected honour to Ramesses as a symbol of his putative divine nature and power. Ramesses decided to eternalize himself in stone, and so he ordered changes to the methods used by his masons. The elegant but shallow reliefs of previous pharaohs were easily transformed, and so their images and words could easily be obliterated by their successors. Ramesses insisted that his carvings be deeply engraved into the stone, which made them not only less susceptible to later alteration, but also made them more prominent in the Egyptian sun, reflecting his relationship with the sun deity, Ra. Ramesses constructed many large monuments, including the archaeological complex of Abu Simbel, and the Mortuary temple known as the Ramesseum. He built on a monumental scale to ensure that his legacy would survive the ravages of time. Ramesses used art as a means of propaganda for his victories over foreigners, which are depicted on numerous temple reliefs. Ramesses II erected more colossal statues of himself than any other pharaoh, and also usurped many existing statues by inscribing his own cartouche on them. Oriented northwest and southeast, the temple was preceded by two courts. An enormous pylon stood before the first court, with the royal palace at the left and the gigantic statue of the king looming up at the back. Only fragments of the base and torso remain of the syenite statue of the enthroned pharaoh, 17 metres (56 ft) high and weighing more than 1,000 tonnes (980 long tons; 1,100 short tons). Scenes of the great pharaoh and his army triumphing over the Hittite forces fleeing before Kadesh are represented on the pylon. Remains of the second court include part of the internal facade of the pylon and a portion of the Osiride portico on the right. Scenes of war and the alleged rout of the Hittites at Kadesh are repeated on the walls. In the upper registers, feast and honor of the phallic deity Min, god of fertility. On the opposite side of the court the few Osiride pillars and columns still remaining may furnish an idea of the original grandeur. Scattered remains of the two statues of the seated king also may be seen, one in pink granite and the other in black granite, which once flanked the entrance to the temple. Thirty-nine out of the forty-eight columns in the great hypostyle hall (41 × 31 m) still stand in the central rows. They are decorated with the usual scenes of the king before various deities. Part of the ceiling, decorated with gold stars on a blue ground, also has been preserved. Ramesses's children appear in the procession on the few walls left. The sanctuary was composed of three consecutive rooms, with eight columns and the tetrastyle cell. Part of the first room, with the ceiling decorated with astral scenes, and few remains of the second room are all that is left. Vast storerooms built of mud bricks stretched out around the temple. Traces of a school for scribes were found among the ruins. A temple of Seti I, of which nothing remains beside the foundations, once stood to the right of the hypostyle hall. In 1255 BC Ramesses and his queen Nefertari had traveled into Nubia to inaugurate a new temple, the great Abu Simbel. It is an ego cast in stone; the man who built it intended not only to become Egypt's greatest pharaoh, but also one of its deities. As well as the temples of Abu Simbel, Ramesses left other monuments to himself in Nubia. His early campaigns are illustrated on the walls of Beit el-Wali (now relocated to New Kalabsha). Other temples dedicated to Ramesses are Derr and Gerf Hussein (also relocated to New Kalabsha). The tomb of the most important consort of Ramesses was discovered by Ernesto Schiaparelli in 1904. Although it had been looted in ancient times, the tomb of Nefertari is extremely important, because its magnificent wall painting decoration is regarded as one of the greatest achievements of ancient Egyptian art. A flight of steps cut out of the rock gives access to the antechamber, which is decorated with paintings based on chapter 17 of the Book of the Dead. This astronomical ceiling represents the heavens and is painted in dark blue, with a myriad of golden five-pointed stars. The east wall of the antechamber is interrupted by a large opening flanked by representation of Osiris at left and Anubis at right; this in turn leads to the side chamber, decorated with offering scenes, preceded by a vestibule in which the paintings portray Nefertari presented to the deities, who welcome her. On the north wall of the antechamber is the stairway down to the burial chamber, a vast quadrangular room covering a surface area of about 90 square metres (970 sq ft), its astronomical ceiling supported by four pillars entirely decorated. Originally, the queen's red granite sarcophagus lay in the middle of this chamber. According to religious doctrines of the time, it was in this chamber, which the ancient Egyptians called the golden hall, that the regeneration of the deceased took place. This decorative pictogram of the walls in the burial chamber drew inspirations from chapters 144 and 146 of the Book of the Dead: in the left half of the chamber, there are passages from chapter 144 concerning the gates and doors of the kingdom of Osiris, their guardians, and the magic formulas that had to be uttered by the deceased in order to go past the doors. By the time of his death, aged about 90 years, Ramesses was suffering from severe dental problems and was plagued by arthritis and hardening of the arteries. He had made Egypt rich from all the supplies and riches he had collected from other empires. He had outlived many of his wives and children and left great memorials all over Egypt. Nine more pharaohs took the name Ramesses in his honour. Ramesses II originally was buried in the tomb KV7 in the Valley of the Kings, but because of looting, priests later transferred the body to a holding area, re-wrapped it, and placed it inside the tomb of queen Ahmose Inhapy. Seventy-two hours later it was again moved, to the tomb of the high priest Pinedjem II. All of this is recorded in hieroglyphics on the linen covering the body of the coffin of Ramesses II. His mummy is today in Cairo's Egyptian Museum. The pharaoh's mummy reveals an aquiline nose and strong jaw. It stands at about 1.7 metres (5 ft 7 in). Gaston Maspero, who first unwrapped the mummy of Ramesses II, writes, "on the temples there are a few sparse hairs, but at the poll the hair is quite thick, forming smooth, straight locks about five centimeters in length. White at the time of death, and possibly auburn during life, they have been dyed a light red by the spices (henna) used in embalming...the moustache and beard are thin...The hairs are white, like those of the head and eyebrows...the skin is of earthy brown, splotched with black... the face of the mummy gives a fair idea of the face of the living king." In 1974 Egyptologists visiting his tomb noticed that the mummy's condition was rapidly deteriorating and flew it to Paris for examination. Ramesses II was issued an Egyptian passport that listed his occupation as "King (deceased)". [not in citation given] The mummy was received at Paris–Le Bourget Airport with the full military honours befitting a king. In 1975, the mummy of Ramesses II was taken to France for preservation. The mummy was also forensically tested by Professor Pierre-Fernand Ceccaldi, the chief forensic scientist at the Criminal Identification Laboratory of Paris. Professor Ceccaldi determined that: "Hair, astonishingly preserved, showed some complementary data—especially about pigmentation: Ramses II was a ginger haired 'cymnotriche leucoderma'." The description given here refers to a fair-skinned person with wavy ginger hair. Subsequent microscopic inspection of the roots of Ramesses II's hair proved that the king's hair originally was red, which suggests that he came from a family of redheads. This has more than just cosmetic significance: in ancient Egypt people with red hair were associated with the deity Set, the slayer of Osiris, and the name of Ramesses II's father, Seti I, means "follower of Seth." During the examination, scientific analysis revealed battle wounds, old fractures, arthritis, and poor circulation. Ramesses II's arthritis is believed to have made him walk with a hunched back for the last decades of his life. A recent study excluded ankylosing spondylitis as a possible cause. A significant hole in the pharaoh's mandible was detected. Researchers observed "an abscess by his teeth (which) was serious enough to have caused death by infection, although this cannot be determined with certainty". Ramesses is the basis for Percy Bysshe Shelley's poem "Ozymandias". Diodorus Siculus gives an inscription on the base of one of his sculptures as: "King of Kings am I, Osymandias. If anyone would know how great I am and where I lie, let him surpass one of my works." This is paraphrased in Shelley's poem. The life of Ramesses II has inspired many fictional representations, including the historical novels of the French writer Christian Jacq, the Ramsès series; the graphic novel Watchmen, in which the character of Adrian Veidt uses Ramesses II to form part of the inspiration for his alter-ego, Ozymandias; Norman Mailer's novel Ancient Evenings, which is largely concerned with the life of Ramesses II, though from the perspective of Egyptians living during the reign of Ramesses IX; and the Anne Rice book The Mummy, or Ramses the Damned (1989), in which Ramesses was the main character. In entertainment and media, Ramesses II is one of the more popular candidates for the Pharaoh of the Exodus. He is cast in this role in the 1944 novella The Tables of the Law by Thomas Mann. Although not a major character, Ramesses appears in Joan Grant's So Moses Was Born, a first person account from Nebunefer, the brother of Ramoses, which paints a picture of the life of Ramoses from the death of Seti, replete with the power play, intrigue, and assassination plots of the historical record, and depicting the relationships with Bintanath, Tuya, Nefertari, and Moses. In The Kane Chronicles Ramesses is an ancestor of the main characters Sadie and Carter Kane. In film, Ramesses was played by Yul Brynner in Cecil B. DeMille's classic The Ten Commandments (1956). Here Ramesses was portrayed as a vengeful tyrant as well as the main antagonist of the film, ever scornful of his father's preference for Moses over "the son of [his] body". The animated film The Prince of Egypt (1998) also featured a depiction of Ramesses (voiced by Ralph Fiennes), portrayed as Moses' adoptive brother, and ultimately as the film's villain. More recently, Joel Edgerton played Ramesses in the 2014 film Exodus: Gods and Kings. ^ a b c Tyldesly 2001, p. xxiv. ^ "Mortuary temple of Ramesses II at Abydos". Archived from the original on 2008-12-22. Retrieved 2008-10-28. ^ a b Anneke Bart. "Temples of Ramesses II". Retrieved 2008-04-23. ^ "Ramses". Webster's New World College Dictionary. Wiley Publishing. 2004. ^ "Rameses". Webster's New World College Dictionary. Wiley Publishing. 2004. ^ Diodorus Siculus. "Diodorus Siculus, Bibliotheca Historica, Books I-V, book 1, chapter 47, section 4". www.perseus.tufts.edu. ^ Rice (1999), p. 165. ^ von Beckerath (1997), pp. 108, 190. ^ Brand (2000), pp. 302–05. ^ O'Connor & Cline (1998), p. 16. ^ Christian Leblanc. "Gerard". Archived from the original on 2007-12-04. Retrieved 2008-04-23. ^ Rice (1999), p. 166. ^ R. Gabriel, The Great Armies of Antiquity, 6. ^ Grimal (1992), pp. 250–53. ^ Drews 1995, p. 54: "Already in the 1840s Egyptologists had debated the identity of the "northerners, coming from all lands," who assisted the Libyan King Meryre in his attack upon Merneptah. Some scholars believed that Meryre's auxiliaries were merely his neighbors on the Libyan coast, while others identified them as Indo-Europeans from north of the Caucasus. It was one of Maspero's most illustrious predecessors, Emmanuel de Rougé, who proposed that the names reflected the lands of the northern Mediterranean: the Lukka, Ekwesh, Tursha, Shekelesh, and Shardana were men from Lydia, Achaea, Tyrsenia (western Italy), Sicily, and Sardinia." De Rougé and others regarded Meryre's auxiliaries—these "peoples de la mer Méditerranée"—as mercenary bands, since the Sardinians, at least, were known to have served as mercenaries already in the early years of Ramesses the Great. Thus the only "migration" that the Karnak Inscription seemed to suggest was an attempted encroachment by Libyans upon neighboring territory." ^ Gale, N.H. 2011. ‘Source of the Lead Metal used to make a Repair Clamp on a Nuragic Vase recently excavated at Pyla-Kokkinokremos on Cyprus'. In V. Karageorghis and O. Kouka (eds. ), On Cooking Pots, Drinking Cups, Loomweights and Ethnicity in Bronze Age Cyprus and Neighbouring Regions, Nicosia. ^ O'Connor & Cline 2003, pp. 112–13. ^ Tyldesley (2000), p. 53. ^ "The Naue Type II Sword". Retrieved 2008-05-30. ^ Grimal (1994), pp. 253 ff. ^ Tyldesley, Ramesses, p. 68. ^ Ancient Discoveries: Egyptian Warfare. History Channel Program: Ancient Discoveries: Egyptian Warfare with panel of three experts. Event occurs at 12:00 EDST, 2008-05-14. Archived from the original on April 16, 2008. Retrieved 2008-05-15. Egyptian monuments and great works of art still astound us today. We will reveal another surprising aspect of Egyptian life—their weapons of war, and their great might on the battlefield. A common perception of the Egyptians is of a cultured civilization, yet there is fascinating evidence that reveals they were also a war faring people, who developed advanced weapon making techniques. Some of these techniques would be used for the very first time in history and some of the battles they fought were on a truly massive scale. ^ 100 Battles, Decisive Battles that Shaped the World, Dougherty, Martin, J., Parragon, pp. 10–11. ^ Grimal (1992), p. 256. ^ Kitchen (1996), p. 26. ^ Kitchen (1979), pp. 223–24. ^ Kitchen (1996), p. 47. ^ Kitchen (1996), p. 46. ^ Kitchen (1982), p. 68. ^ Kitchen (1982), p. 74. ^ Grimal, op. cit., p. 256. ^ Kitchen (1983), pp. 62–64, 73–79. ^ Grimal (1992), p. 257. ^ Stieglitz (1991), p. 45. ^ Kitchen (1982), p. 215. ^ "Beit el-Wali". University of Chicago. Retrieved 2008-04-21. ^ Geoff Edwards. "Zawiyet Umm el-Rakham". Retrieved 2008-04-07. ^ "Sed festival". The Global Egyptian Museum. Retrieved 2008-04-07. ^ "Renewal of the kings' Reign : The Sed Heb of Ancient Egypt". ^ Amelia Ann Blandford Edwards. "Chapter XV: Rameses the Great". Retrieved 2008-04-23. ^ Kitchen (1982), p. 119. ^ a b Kitchen (2003), p. 255. ^ Dearman, John Andrew; Graham, Matt Patrick; Miller, James Maxwell, eds. (2001). The Land that I Will Show You: Essays on the History and Archaeology of the Ancient Near East in Honour of J. Maxwell Miller. Sheffield Academic Press. "The Geography of the Exodus", by John Van Seters, p. 265. ISBN 978-1-84127-257-3. Retrieved 27 February 2015. ^ Diodorus Siculus (1814). The Historical Library of Diodorus the Sicilian. Printed by W. MʻDowall for J. Davis. pp. Ch. 11, &nbsp, p. 33. ^ a b c Skliar (2005). ^ a b Guy Lecuyot. "The Ramesseum (Egypt), Recent Archaeological Research" (PDF). Archived from the original (PDF) on 2008-05-29. Retrieved 2008-04-10. ^ "À l'école des Scribes" (in French). Retrieved 2008-04-21. ^ Kitchen (1982), pp. 64–65. ^ a b c Siliotti (1994). ^ "Tomb of Ramses II sons". Retrieved 27 February 2015. ^ a b Tyldesley (2000), pp. 161–62. ^ "Giant Ramses statue gets new home". BBC NEWS. 2006-08-25. Retrieved 2008-07-05. ^ Hawass, Zahi. "The removal of Ramses II Statue". Retrieved 2007-03-17. ^ "La momie de Ramsès II. Contribution scientifique à l'égyptologie". Retrieved 27 February 2015. ^ Rohl 1995, pp. 72-73, 75. ^ Rohl 1995, pp. 78-79. ^ Tyldesley (2000) p. 14. ^ Romer, John. Valley of the Kings. Castle Books. p. 184. ^ Maspero, Gaston (1892). Egyptian Archaeology. Putnam. pp. 76–77. ^ John Ray. "Ramesses the Great". BBC. Retrieved 2008-05-15. ^ "Engineering Egypt". National Geographic. Archived from the original on April 14, 2010. Retrieved July 22, 2010. ^ Stephanie Pain. "Ramesses rides again". New Scientist. Retrieved 2013-12-13. ^ Ceccaldi, Pierre (1987). "Research on the Mummy of Ramasses II". Bulletin de l'Académie de Médecine. 171:1 (1): 119. ^ "Bulletin de l'Académie nationale de médecine". Gallica. 1987-01-06. ^ Bob Brier, Egyptian Mummies: Unravelling the Secrets of an Ancient Art, New York: William Morrow & Co. Inc, 1994, p. 153. ^ Brier, Egyptian Mummies (1994), pp. 200–01. ^ Can. Assoc. Radiol. J. 2004 Oct; 55(4):211–17, PMID 15362343. ^ John Ray. "Ramesses the Great". BBC history. Retrieved 2008-05-30. Balout, L.; Roubet, C.; Desroches-Noblecourt, C. (1985). La Momie de Ramsès II: Contribution Scientifique à l'Égyptologie. Bietak, Manfred (1995). Avaris: Capital of the Hyksos – Recent Excavations. London: British Museum Press. ISBN 978-0-7141-0968-8.
von Beckerath, Jürgen (1997). Chronologie des Pharaonischen Ägypten. Mainz: Philipp von Zabern. Brand, Peter J. (2000). The Monuments of Seti I: Epigraphic, Historical and Art Historical Analysis. NV Leiden: Brill. ISBN 978-90-04-11770-9. Brier, Bob (1998). The Encyclopedia of Mummies. Checkmark Books. Clayton, Peter (1994). Chronology of the Pharaohs. Thames & Hudson. Dodson, Aidan; Dyan Hilton (2004). The Complete Royal Families of Ancient Egypt. Thames & Hudson. ISBN 978-0-500-05128-3. Grajetzki, Wolfram (2005). Ancient Egyptian Queens – a hieroglyphic dictionary. London: Golden House Publications. ISBN 978-0-9547218-9-3. Grimal, Nicolas (1992). A History of Ancient Egypt. Oxford: Blackwell. ISBN 978-0-631-17472-1. Kitchen, Kenneth (1983). Pharaoh Triumphant: The Life and Times of Ramesses II, King of Egypt. London: Aris & Phillips. ISBN 978-0-85668-215-5. Kitchen, Kenneth Anderson (2003). On the Reliability of the Old Testament. Michigan: William B. Eerdmans Publishing Company. ISBN 978-0-8028-4960-1. Kitchen, Kenneth Anderson (1996). Ramesside Inscriptions Translated and Annotated: Translations. Volume 2: Ramesses II; Royal Inscriptions. Oxford: Blackwell Publishers. ISBN 978-0-631-18427-0. Translations and (in the 1999 volume below) notes on all contemporary royal inscriptions naming the king. Kitchen, Kenneth Anderson (1999). Ramesside Inscriptions Translated and Annotated: Notes and Comments. Volume 2: Ramesses II; Royal Inscriptions. Oxford: Blackwell Publishers. Kuhrt, Amelie (1995). The Ancient Near East c. 3000–330 BC. Vol. 1. London: Routledge. O'Connor, David; Eric Cline (1998). Amenhotep III: Perspectives on his reign. University of Michigan Press. Putnam, James (1990). An introduction to Egyptology. Rice, Michael (1999). Who's Who in Ancient Egypt. Routledge. ISBN 978-0-415-15448-2. Ricke, Herbert; George R. Hughes; Edward F. Wente (1967). The Beit el-Wali Temple of Ramesses II. Rohl, David M. (1995). Pharaohs and Kings: A Biblical Quest (illustrated, reprint ed.). Crown Publishers. ISBN 9780517703151. Siliotti, Alberto (1994). Egypt: temples, people, gods. Skliar, Ania (2005). Grosse kulturen der welt-Ägypten. Stieglitz, Robert R. (1991). "The City of Amurru". Journal of Near Eastern Studies. 50.1. Tyldesley, Joyce (2000). Ramesses: Egypt's Greatest Pharaoh. London: Viking/Penguin Books. Westendorf, Wolfhart (1969). Das alte Ägypten (in German). Hasel, Michael G. 1994. “Israel in the Merneptah Stela," Bulletin of the American Schools of Oriental Research 296, pp. 45–61. This page is based on the Wikipedia article Ramesses II; it is used under the Creative Commons Attribution-ShareAlike 3.0 Unported License (CC-BY-SA). You may redistribute it, verbatim or modified, providing that you comply with the terms of the CC-BY-SA.